You think that you know someone but there are always little things that surface and surprise you. Example: yesterday I made the peanut butter and jelly sandwiches for today's ride, and consistent with normal etiquette in the civilized world, cut each sandwich into halves. Today I found out that David likes his sandwiches WHOLE...go figure. We pulled out of Carson City in the early morning and after a few miles looked back at the snow covered highest peaks of the Sierra Mountain range which we descended from yesterday. Today they look so far away! Goodbye Sierras, hello Nevada desert. What a contrast...snow capped mountains to desert dust devils! 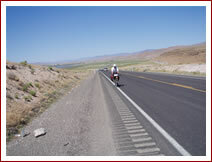 We are now following Highway 50 across Nevada, dubbed "the lonliest road in America". 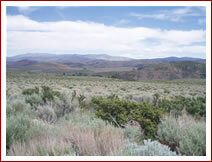 This section is the Carson route, a National Historic Trail which was used by early settlers travelling to California. Later in the day we traversed the California Emigrant Trail and passed close to Ragtown, which was the first water stop some 40 miles across the desert after the Humboldt River. 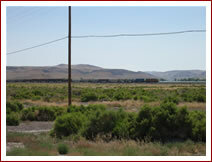 Our destination was Fallon, home of the Fallon Naval Air station which trains the Navy's "Top Gun" pilots.